One of the missions of EFOMP is promoting education and training programmes in Europe. In recent years we have accomplished this task by participating in European consortia (Eutempe-RX net) or by organizing directly through the European School for Medical Physics Expert (ESMPE) 15 editions of the School in the various sub-specialties of Medical Physics. 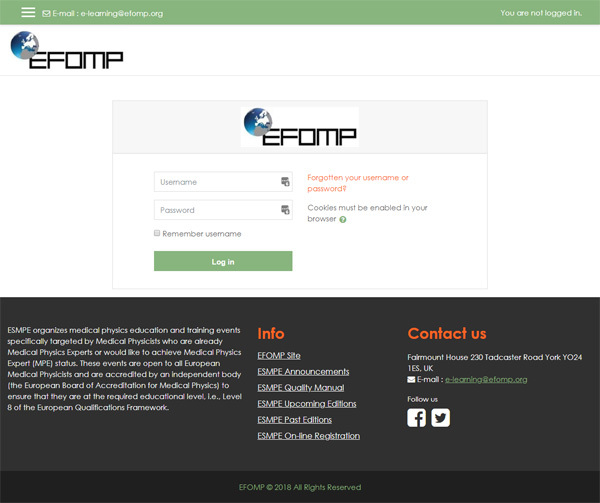 Under the coordination of EFOMP Communications and Publications Committee, and the collaboration of the ESMPE Board Chair, we have now established a new tool for providing education opportunities for our community and we are proud of announcing the opening of an e-learning platform on the EFOMP website. In this platform, the pdfs of the lectures given during the two satellite meetings (Fundamentals of Nuclear Medicine Dosimetry, IMRT&VMAT in practice) have been already uploaded, as well as the video recordings of the third satellite meeting (Statistics of Medical Physics) which were held during ECMP2018 in Copenhagen and have been organized under the umbrella of the ESMPE. Initially, the access will be granted to all the registered participants to the ECMP 2018 by providing them security credentials and a quick user guide. An email will be sent to all users within the next weeks. For the future, we plan to upload in the e-learning platform the video recordings of all the new editions of the ESMPE and of all the educational events organized directly by EFOMP. The e-learning platform will be supervised by the Education & Training (ET) Committee in collaboration with the Communications & Publications (CP) Committee.The EFOMP board will discuss on how to grant access to the widest platea of European Medical Physicist, in the next future.